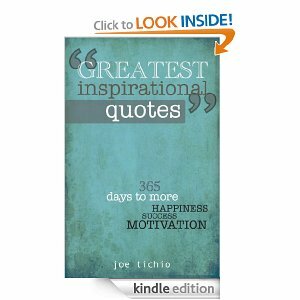 ﻿Joe Tichio has created Greatest Inspirational Quotes: 365 Days to more Happiness, Success and Motivation. It would make a wonderful and very inexpensive ($2.99) gift for yourself and others who have a Kindle or a Kindle reader on their computers. I have free Kindle readers on my laptop and desk computers, so I can read electronically without buying another electronic item. Here is the Amazon link: http://amzn.com/B00ARPYS6K. The author’s website is http://www.greatest-inspirational-quotes.com, and that is a wonderful resource as well. He seems to have insights, knowledge and skills in a wide range of things related to self-improvement, motivation and inspiration, and this collection is an outgrowth of that. I have had a few calendars with daily quotes, which would give me 365 of them right on my desk. Unfortunately, I always forget to flip the pages on calendars and I don’t like to sit and read through each day all at once. So, at the end of the year, they’ve gone unread. Mr. Tichio took care of that, by giving them to me in an easy-to-read e-book, which I like and have read several times already, marking some good ones to use in my own writing and presenting at some time. Until a person can say deeply and honestly, “I am what I am today because of the choices I made yesterday,” that person cannot say, “I choose otherwise”. Quote collectors like me tend to be very hypercritical conscientious about correct attribution. Sadly, the use of the Internet has spread incorrectly attributed quotations like shredded cheese on top of an extra-large pizza. (That’s my Mickey Spillane impersonation.) It really is no wonder we’ve lost track of who said what, especially after someone more modern and famous has said it in an ever-so-slightly-different way or a zillion quotation sites have taken the easy way out and just attributed everything to Abraham Lincoln, Thomas Edison or Confucius. You may remember, a few months ago I wrote about Mary Jean Irion’s famous lines, nearly always mistakenly attributed to Mary Jean Iron,who does not exist. If possible, I try to find the original text so I can read it in context, as I did with Ms. Irion’s book. I’ve written to Mr. Tichio to tell him I liked the collection a lot—there are at least 300 unique ones, so this isn’t just a rehash, as many quotation books tend to be—and I told him I believe I could offer alternatives to a few attributions. (I’m open to counter-arguments!) After reading all of the quotations you will probably feel so positive, uplifted and inspired, you won’t want to be as picky as I notoriously am! Greatest Inspirational Quotes: 365 Days to more Happiness, Success and Motivation, will be an excellent addition to any library and especially useful for pastors, teachers, leaders and all of us who have similar great thoughts but simply cannot put them into the best words. This book will give you the words. Greatest Inspirational Quotes, by Joe Tichio: http://amzn.com/B00ARPYS6K. I like quote books, so I’ll look at this one. I know what you mean about attribution. I’m always finding small and big errors. Get a Kindle, you’ll enjoy it. D.
We overestimate our achievements and underestimate what we owe to those who helped us achieve. Like the fly who sat on a chariot wheel and said, "What dust I raise!"